Here's the workout from boot camp this evening! It was a tabata workout - 20 seconds of work, 10 seconds rest for 8 rounds. This one was a little different because we alternated exercises, so we ended up doing 4 of each. (Ex: 20 sec sit ups, 10 sec rest, 20 sec planks, 10 sec rest - repeat 4 times. Rest for 1 minute before moving on to the next set.) You can find a lot of different tabata timer apps. Funny how time works... it feels like the longest 20 seconds of your life and the shortest 10. 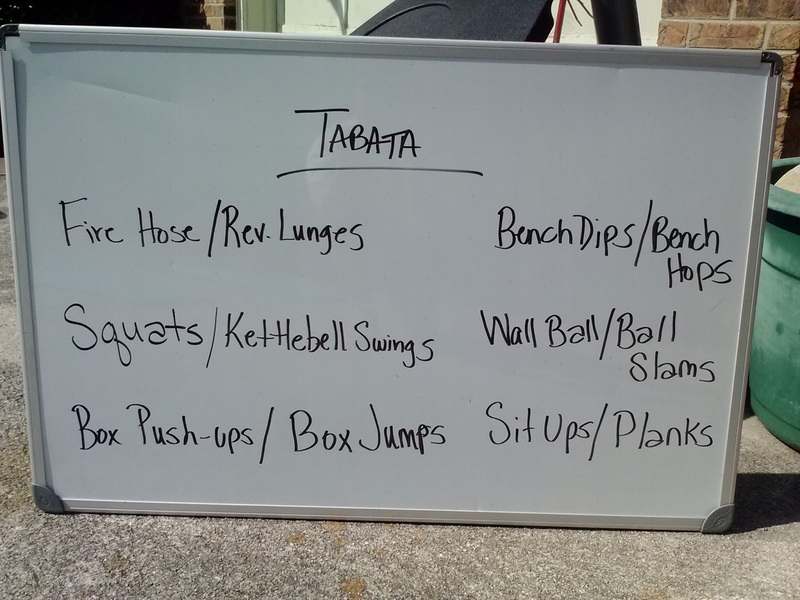 I actually like this kind of workout and it is easy to alter to fit your needs. We did rope slams with the fire hoses - I had never done that before. Whew!! That is some hard work, I definitely need some more practice with it. I always feel accomplished after boot camp!